Different online platforms and manufacturers ' websites require different payment methods. Despite their abundance, it can still be inconvenient. For example, cash is absolutely impossible to pay on the Internet, you need to have a card-intermediary, and even more than one. Or crypto-currencies, which if accepted by sellers, are not all and not all. Banks, credit card companies, trading platforms and manufacturers themselves have very different but incomplete information about consumers. Her Association could help everyone. All participants in the online shopping chain have a huge amount of data about their customers, while customers often do not understand that they give them such power and even allow them to benefit from it in a way, the innovative Carry platform is a factor that unites producers and consumers in one system simultaneously solving all the above problems. The Carry Protocol service begins when a consumer purchases goods or services from a store. The Carry Protocol supports credit cards and cash as well as cryptocurrencies, making it easy to use for everyone. The Carry Protocol will also accept payments in other cryptocurrencies such as BTC and ETH. Many sellers are reluctant to accept cryptocurrency for Fiat money, creating a need for a "payment service provider" to convert cryptocurrency into Fiat money for the seller. Anyone can become a payment service provider in the Carry Protocol, and sellers can work with payment service providers of their choice. Sellers can also get cryptocurrency directly, in this case they can collect the fee without the help of a settlement service provider. Currently, most consumers are likely to pay in Fiat. These transactions go through the same processes as existing transactions and therefore do not require any additional action on the part of the sellers. Vendors must be equipped with an interactive device, such as a tablet, to use the transfer Protocol. Most sellers already have a POS device (point of sale) that can function as a transfer Protocol device or require a separate device such as a tablet. The device will send the transaction data from the POS to the client and help the client to upload this data to the blockchain. Sellers often provide loyalty points or coupons to customers as a way to reward. Carry Protocol helps with this purpose by providing tokens branded for each merchant. After completing the transaction in the store, consumers will receive the transaction data in their e-wallet. There are several ways to get transaction data: enter the phone number on the device, or scan the QR code from the device. The consumer can then decide whether they will upload the transaction data to the blockchain. It is entirely up to the consumer to download the data or not, partially or completely. Carry Protocol gives complete power over data to consumers to realize their mission of giving the consumer control over their personal information. 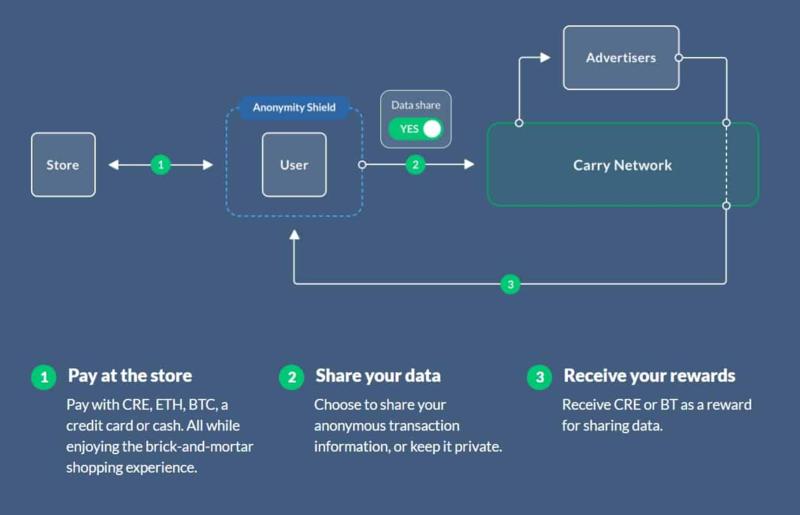 The consumer chooses to download the transaction data, whether partially or completely, their privacy will be protected by anonymity protection and data encryption.The Carry Protocol gives consumers a CRE token as a reward for uploading their transactional data to the blockchain, thereby encouraging more downloads.Transaction data stored on the blockchain is likely to be used primarily for targeted advertising. Advertisers can process the available data and narrow down the range of consumers that meet their marketing needs to update their Carry advertising. If advertisers find it difficult to process these transactions on their own, the "advertising service Provider" can help them identify the right targets for their ads. Ads sent in W Protocol Carry. Based on its property, BT can be a coupon to use on your next visit or a simple promotional display. On the receiving side, consumers see the ad on their wallet in the form of BT. Consumers can choose whether they want to receive advertising by customizing their app and even choose specific areas of interest for advertising. The purpose of the Carry token (CRE) is to ensure the development of the Carry Protocol and the formation of its ecosystem. Supporters can take part in the event the token generation through the transmission of cryptocurrency. The exchange rate of the tokens to be transferred to the participants will be announced through the Carry Protocol communication channels (website, Facebook, Twitter, etc.) before the token generation event. 10 million tokens will be issued, of which 40% will be allocated to the participants of the token generation event. About 25% of the tokens will be allocated to the above — mentioned partner program (4.2), 15% — to activate the market through airdrop for sellers and consumers, 10% — for the Carry team, which is working on creating an ecosystem, 5% - for consultants helping with the launch of the Carry Protocol, and 5% will be saved as a reserve. Funds collected through the events of the token generation will be used for development of the Protocol to Carry and the creation of its ecosystem. About 30% of the funds will be invested back into research and development, 25% on the provision of the necessary devices for the sellers (for example, hardware), 25% on total business activity, providing management Protocol Carry and facilitate the acquisition of the business of stability (operating expenses and the development expenditure of the business). The company plans to issue 10 billion tokens, 4 of which will go on sale, and the rest will be distributed among the members of the company, its advisors and will go to the development of the project. The company will announce the start of token sales in its social networks. Meanwhile, to plan the launch of the platform will take place in late 2019. Now many seemingly modern technologies are already in need of innovation. Thanks to blockchain, we can optimize and simplify all areas of our life, starting with those we use every day. Carry company can help us in this and become a popular product.